Now Enjoy Warm (or Cold), Luxurious, Gourmet Coffee on Any Mountaintop! Adventurers rejoice! Enjoy the simple but superb pleasure of a great cup of coffee while roughing it, anywhere you go. Whether it be the peak of Mount Everest, or while navigating the NYC Subway, this gourmet hot and cold coffee brewer lets you drink gourmet coffee in any situation. Light on your hands, ultra-smooth brew extraction, and spill-proof... it's a true traveler's companion that fuels your adventures. Simply add ground coffee and water and within minutes you have a delicious brew. 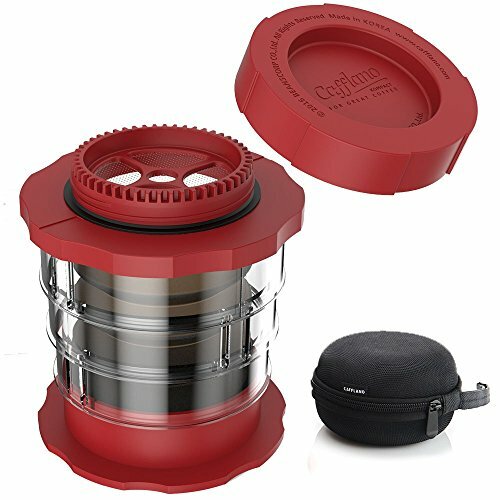 Carrying cold brew has never been easier thanks to Cafflano Kompact's spill-free airlock cap, not to mention its portability. Cafflano Kompact comes with a luxurious black fabric hard case that protects from scratches and damages. It takes less than 30 seconds to clean Cafflano Kompact, so that you can prepare another cup of joe right away! HOT AND COLD Coffee Maker - Brew Hot, or Also Cold Brew by Simply Putting Coffee Grounds into Cafflano Kompact, Adding Water, and Closing Airlock Cap... No Spills! FATIGUED From Your Aeropress? Tired of BITTER Coffee? Cafflano Kompact is Easy to Squeeze, and Brews Extra Smooth Coffee! If you have any questions about this product by Cafflano, contact us by completing and submitting the form below. If you are looking for a specif part number, please include it with your message.